Kenny Chesney's Love Note To Caribbean After Disaster: It's About The Moving Forward Country star Kenny Chesney went into the studio as therapy after hurricanes tore through the U.S. Virgin Islands, the place he calls home. Those sessions became his latest album, Songs for the Saints. "It was a sobering experience. I knew it was bad, but until you see it — I wasn't prepared for it, to be honest with you," Kenny Chesney says. Last year, Hurricane Irma blasted through the Caribbean, leveling schools, homes and businesses, and leaving people emotionally battered. 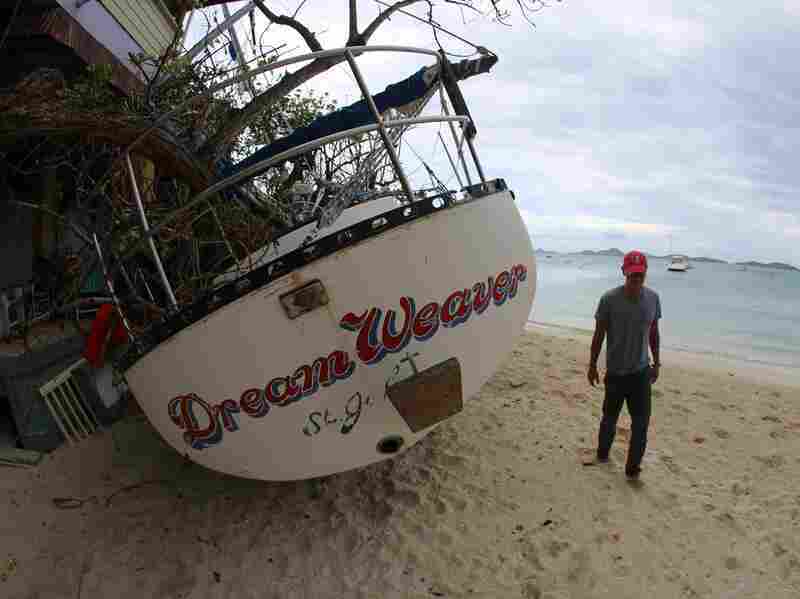 A couple of weeks later, Hurricane Maria swept through and added to the devastation. In the days and weeks after the two storms, people tried to find ways to help. Country music star Kenny Chesney, who lives in St. John in the U.S. Virgin Islands when he isn't on tour, started sending supplies and helping get people off the islands and to the continental U.S. soon after the hurricane. He also established a foundation called Love for Love City. As you might expect from the man who holds the Billboard record for the most No. 1 country songs, he started writing songs about what he was seeing and feeling, culminating in an album out July 27 called Songs for the Saints. The album includes features from Ziggy Marley, Jimmy Buffett and Mindy Smith, people he chose because of their connection to his life in the islands. Proceeds from the album's sales will go towards Chesney's Love for Love City foundation. Chesney gave NPR the exclusive video for the acoustic version of his collaboration with Marley, "Love for Love City" and spoke with NPR's Michel Martin about the aftermath of the hurricanes and how studio therapy turned into the 11-track album. Read the edited conversation below and listen at the audio link. Michel Martin: You weren't on [St. John] when the hurricanes hit, but I just have to ask what it was like for you. Kenny Chesney: It was a stressful time, to say the least. I spent a lot of my adult life so far on the island and became not just friends, but I had a circle of friends that I called family over the years, and I can tell you that it was a very stressful, high anxiety time. It was over a week, there was no text, there were no e-mails because there was no power. There was no service. It was literally still a very dead island, if you will. That was very stressful because I had 17 people and several dogs living underneath my house where they rode out the storm, and I couldn't get a hold of anybody, and I didn't know if everybody had made it. These are green places, and you got there and all the green was gone. I just wonder for a person who spent so much of your life there what it was like for you when you first got there. It was a sobering experience. I knew it was bad, but until you see it — I wasn't prepared for it, to be honest with you. It was two weeks after the storm, and when I landed down there, I got in a helicopter and went around the [British Virgin Islands] and went over into Tortola, and I wasn't really prepared for the amount of destruction and devastation. It broke my heart because I have, like I said, I had so many friends that were still on the island that had their lives turned upside down. And these were people that didn't have vacation homes there, these were people that this was their life. Part of the reason I fell in love with those people was their spirit and the way they look at the world and their spirituality — it's a very spiritual place. When I saw it for the first time, I couldn't believe it. 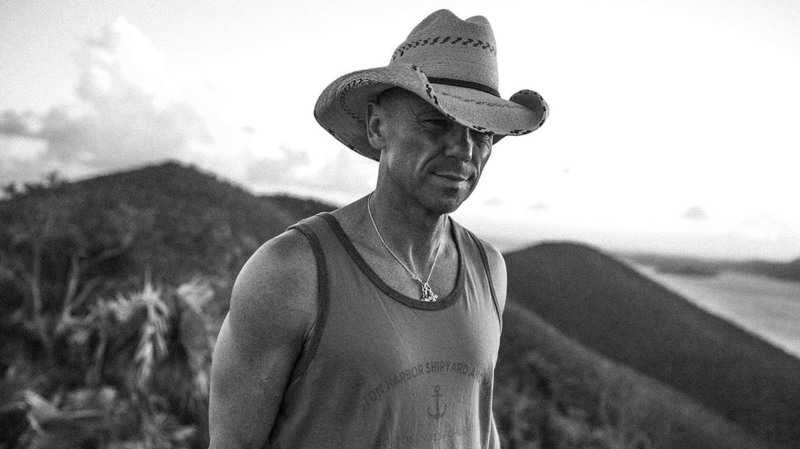 Kenny Chesney walks around the island of St. John after Hurricanes Irma and Maria. I was writing songs, and I went into the studio as a way of therapy. I had no idea what I was going to do with this music. That's where the core of this record, the foundation of this record, was born. I just felt that this music and the help with the foundation would help give people a little bit of help to move forward. The song "Every Heart" captures some of that brokenheartedness. I read the lyrics before I heard it, and I don't know maybe I shouldn't have done that, but I was like, "Woah man, that's so sad." But then when I heard it, it felt warm. How did it come to you? Was it the sad part come that came to you first, or did the hopeful part come to you first? This album isn't necessarily about devastation or the destruction. It's about the moving forward. "Every Heart is an island" is about how there's just such a sense of community. You know I've always felt like an island is a lot like a small town. It has its small town negativity — people may not get along, or there are rumors and everybody knows everybody's business. Any kind of negative slant a small town would have, an island has that also. But when this happened, all that went away because everybody needed help. If there is a silver lining at all there, it was how much love came to the top. That's why I felt like this song is important because it goes to the heart of that sense of community and how everybody just helped everyone. This album isn't necessarily about devastation or the destruction. It's about the moving forward. It's my understanding you're actually a pretty private person, and I wonder if this has called upon you to get out of your comfort zone in a way you really had not expected to. You obviously fill up stadiums so you still have a lot of people looking at you, but you live a very private life when you're not performing, and I wonder if this has brought forward something in you that you didn't know was there necessarily. When this happened, I had to make up my mind whether I was going to worry about my privacy or help people that really needed it, and it was just a natural thing for me to help people that really needed it. Forgive me for asking, but do you have any survivor's guilt? Is there a part of you that feels it's not enough? I can tell you that I felt really guilty I wasn't there as it was happening. But honestly, after the storms, it wasn't a place to be. We were flying planes down to try to get people off, especially pregnant people or elderly or people that had injuries because there was no hospital, and we had to get people off. But there were people there that didn't want to leave because they wanted to stay and help. And a lot of my friends and my own family felt guilty for leaving, but ... for several months, it wasn't a healthy place to be, to be honest with you. Well how are things now? I think the recovery is going to be measured in years. You know, it'll be a year Sept. 6 that these storms happened, believe it or not. And it's getting better. You can just tell it's been hit really hard, and it's not going to recover at once, and you can still tell that its broken a little bit at its core.